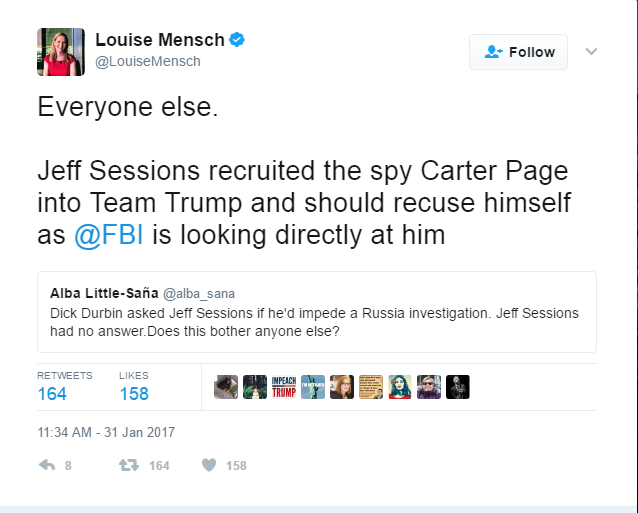 So it looks like Loony Louise is the new media champion of Trump/Russia conspiracy theories. Believe it or not, this poor man’s Alex Jones, despite being fired from her own web project and relegated to posting her ravings on a homebrew Wordpress blog, is being taken seriously by the New York Times, WAPO, and others who ought to know better. 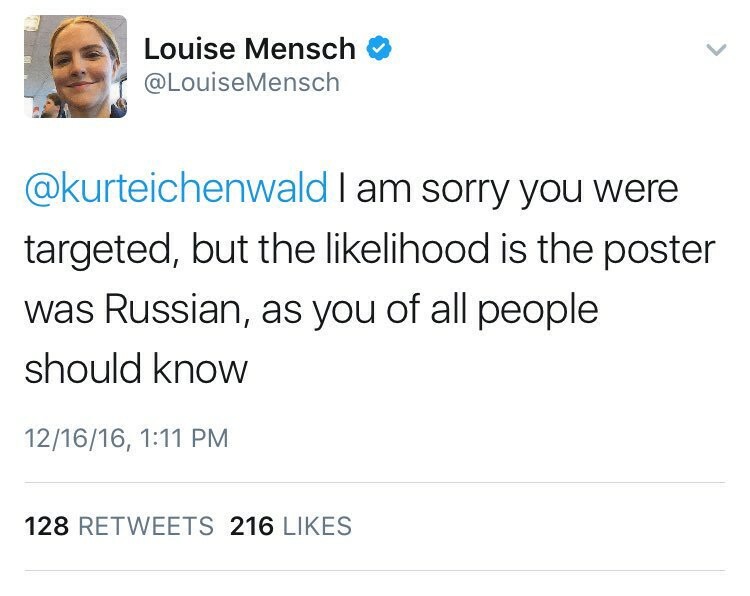 Louise believes that despite the assertion being thoroughly debunked, Trump lawyer Michael Cohen did in fact fly to Prague. In her version, it was not to meet with Kremlin officials, but to pay hacker Yevgeniy Nikulin for various feats. 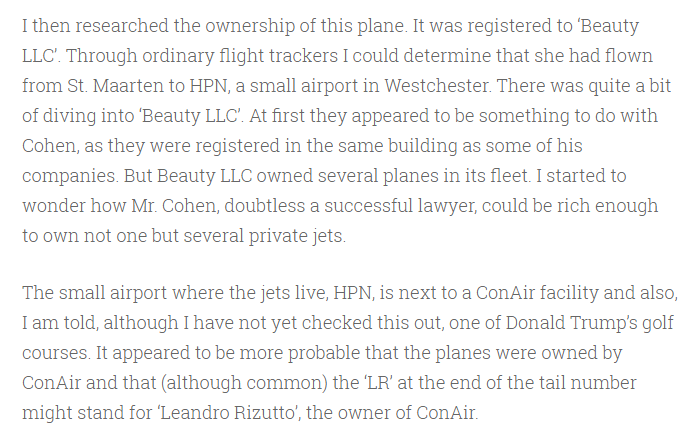 Because Cohen’s whereabouts are generally accounted for, she has crafted an elaborate narrative involving Cohen hiding in a private jet that he owns in secret. 2. 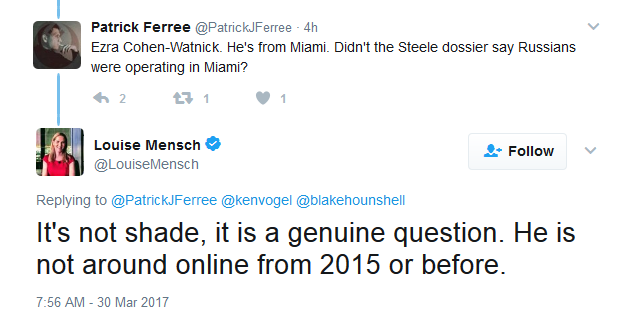 Mensch is interested in Yevgeniy Nikulin because she believes him to have near-superpowers. She believes Nikulin hacked Hillary Clinton’s email server, then used Anthony Weiner’s formspring account to stage an elaborate catfish, pretending to be a sixteen year old girl, then planted a virus in his Formspring app to gain access to Weiner’s laptop (the virus leaped from his phone to his laptop via hacker magic). Sometime later, she claims Nikulin was able to remotely turn on and access the laptop, and fill it’s hard drives with Weiner’s own wife’s emails, and tip off the FBI. 3. 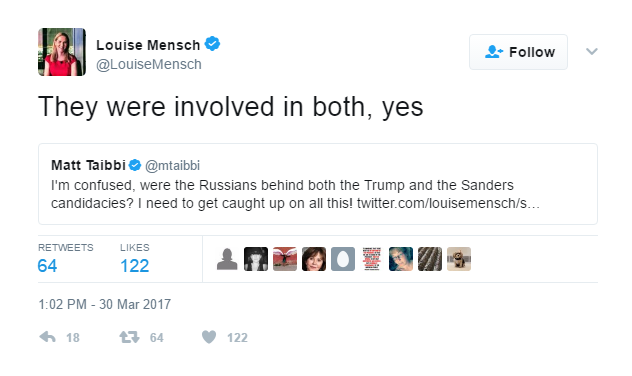 She also believes Nikulin hacked the DNC and gave the emails to Wikileaks. In addition, she believes that Wikileak’s Russian DNS servers are magically intercepting communications from Wikileaks contributors. 4. 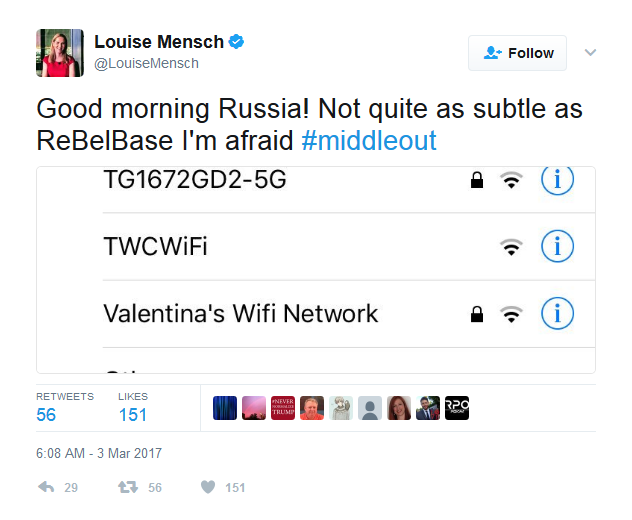 She believes Russians are running WIFI hotspots in her neighborhood. 5. 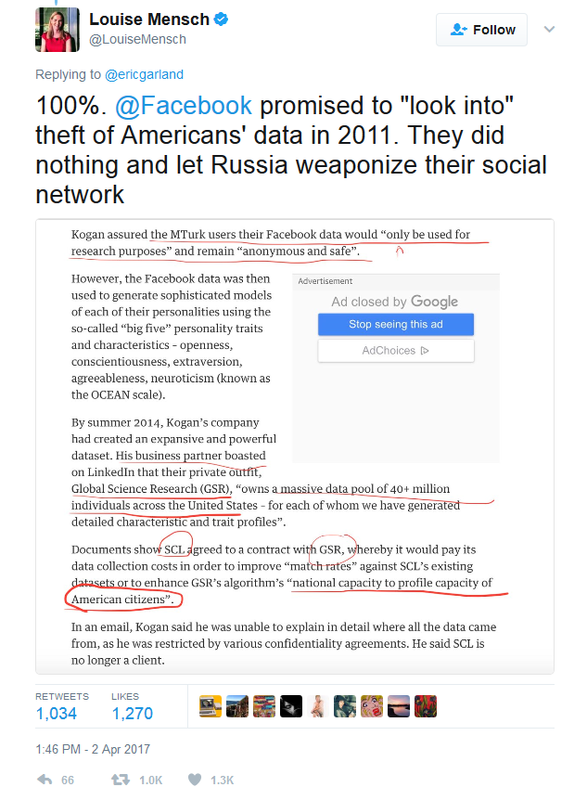 Louise is rather insistent that Putin and Richard Bannon secretly conspired in 2012 to murder conservative publisher Anthony Breitbart, to pave the way for Bannon to take over Breitbart News and shill for Trump’s campaign four years later. 6. 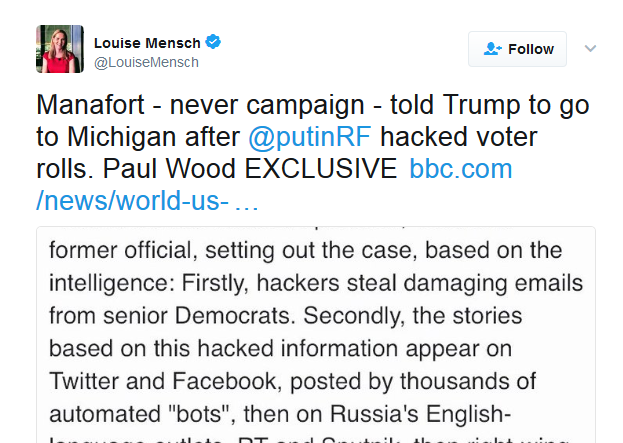 Putin also hacked the Democratic voter rolls, and magically used this information to run Trump’s presidential campaign. 7. 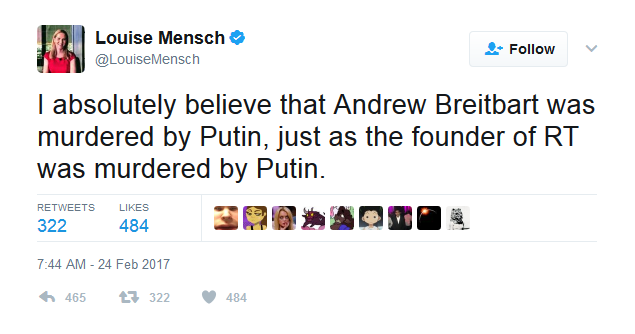 Putin et all were also behind the Bernie Sanders campaign. 8. Russians sent Kurt Eichenwald a blinking gif, causing him to have a seizure, for no apparent reason. 9. Ivanka Trump is helping Russia spy on Americans with spy software disguised as a travel app. Apparently Russians are very interested in spying on Ivanka’s random Twitter followers. 10. 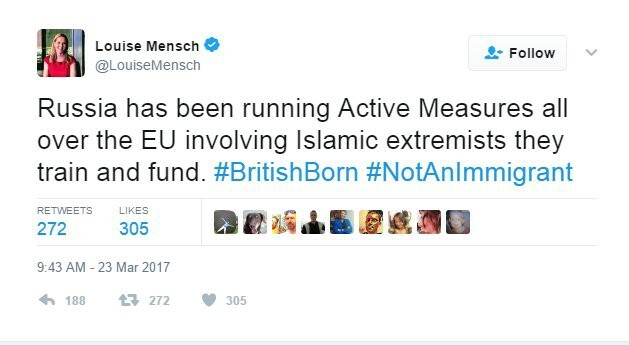 Russia is creating Manchurian ISIS terrorists to fake terror attacks on the West. 11. 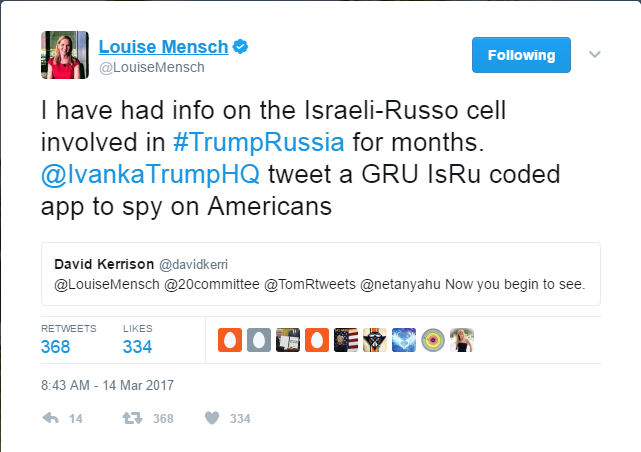 Louise believes NSC director Ezra Cohen-Watnick is not a real person. Instead, he is a spy with a fake persona created by the Russians. She believes this because his Facebook account is only a few years old. 13. Carter Page is a Russian spy. 14. 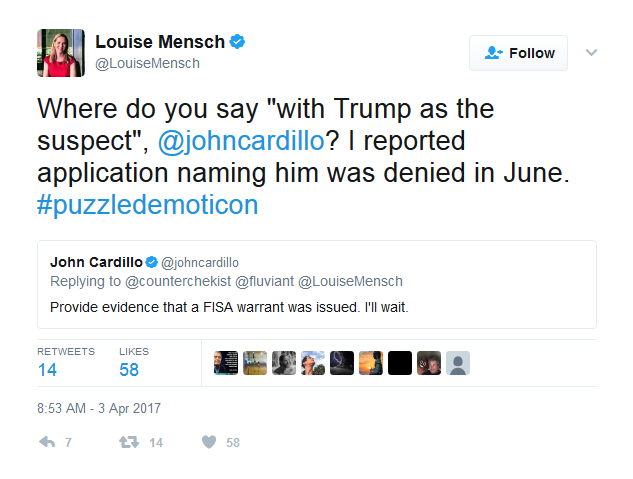 Denial of a FISA warrant naming Trump is proof there is a FISA warrant naming Trump. 15. Russians stole “personality profiles” of US users created by mechanical Turk. For no reason. 16. Chuck Johnson runs Stratcom’s Twiiter account- and vets Trump’s cabinet picks. 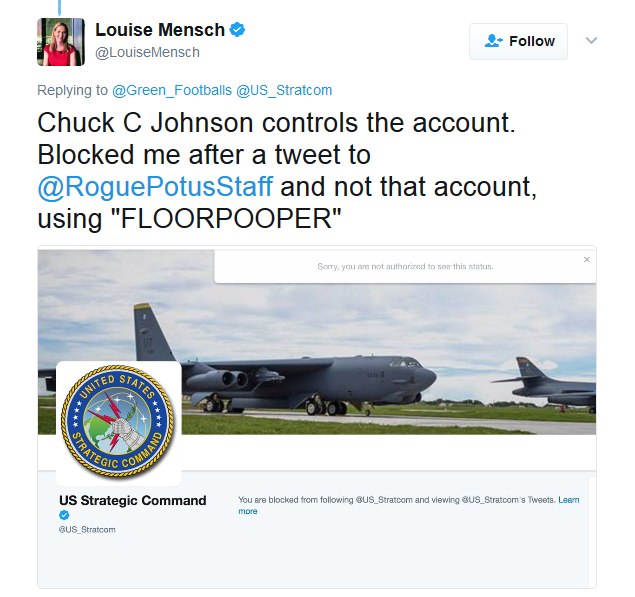 After being blocked for trolling US Stratcom’s twitter account nonstop, Louise deduces this is in retaliation for her claims that a fraudulent “white house staff” account belongs to Chuck C. Johnson. 16b. 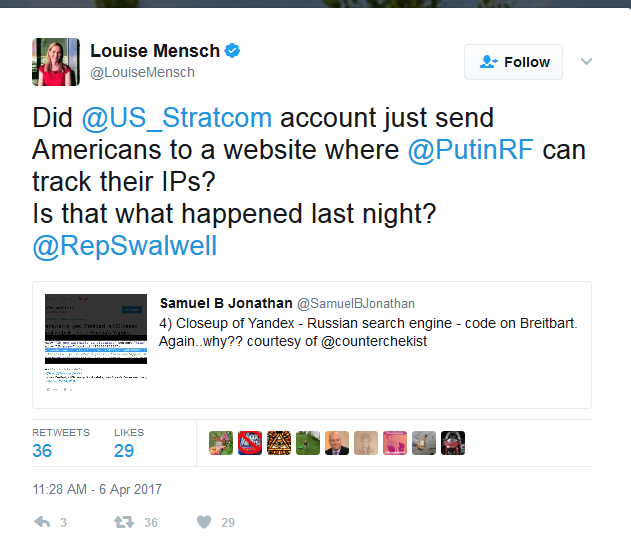 Stratcom is also using Twitter to track IPs for Putin, for no useful reason. Never mind that this is just a meta tag for an SEO placement. Chuck is a busy boy. 17. 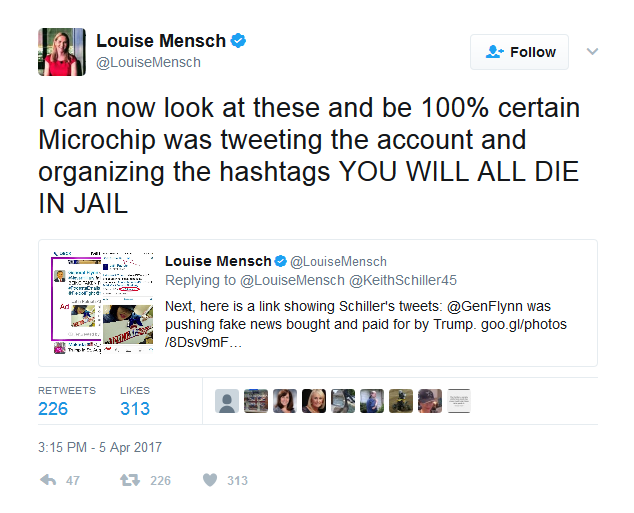 Everyone is getting life sentences in prison for conspiracy to hashtag.